"The Vietnam war was not fifteen years ago. It is today," Thich Nhat Hanh told us on the first evening of the retreat for Vietnam veterans and their families at Omega Institute in Rhinebeck, NY. "If we look deeply at the present, we will see that it is made up of the past. And if we contact the present deeply, we can contact the past and heal it." As the daughter of an Army general who served three tours in Vietnam, I went to that retreat seeking to understand and help heal my own family's past. 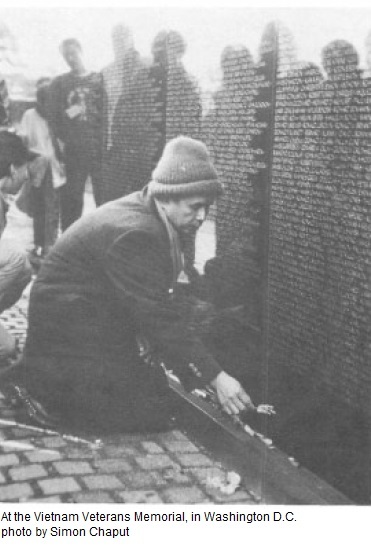 Like hundreds of thousands of children, my childhood was shaped by my father's participation in the Vietnam War: His repeated, prolonged absences (and the never-acknowledged terror that he would not come back alive) drove my mother to an emotional breakdown and left deep wounds in my heart. At the retreat, I had the opportunity not only to contact and heal my own hurt, but to be touched and inspired by the practice of those who had experienced the suffering of war far more painfully and directly than I had. About half of the eighty-five participants were veterans, seeking healing for bodies, minds, and spirits battered by combat. "You are the light at the tip of the candle," Thay told the veterans. "You know what the reality of war is, and you can show it to us." Throughout the retreat, the veterans' courage, honesty, and insights were truly a candle flame illuminating the path for all of us. While nurturing the seeds of mindfulness and peace through quiet breathing, smiling, sitting, and walking, we also began to examine the nature of aggression. In Thay's dharma talks, he asked us to look deeply into the roots of war in our society, our families, and our own hearts—the seeds of violence, fear, and hatred that can be found everywhere, even within the anti-war movement itself. War, he told us, is not just waged by soldiers: all of us participate in it, and all of us must help heal the damage. The veterans are "the hand that grasped the fire," he said; but the order to do so came from the whole body, and the whole body suffers as a result. As part of the body of society, all of us are co-responsible for our country's actions, he said. If we do not understand our co-responsibility, our nation will do the same thing again and again. The daily newspapers brought us stark confirmation of the truth of this teaching: While we were meditating on the roots of war at Omega, the nation was gearing up for massive "victory" parades in Washington, D.C. and New York City. On the last night of the retreat, Thay and Sister Phuong led a deeply moving ceremony in commemoration of those who had died in the Viemam War. On a paper altarcloth wreathed in flowers, veterans and non-veterans pinned notes inscribed with the names of those they wished to remember: "To Roger, thank you for saving my life." "To the Mother Earth and Father Sky of Vietnam." "In memory of all those who died under my guns." Many people wept as Thay chanted Buddhist invocations wishing blessings on all beings, with and without form. Thay then led us in hugging meditation, telling the veterans, "If you hug one Vietnamese person, you hug them all." Afterwards, we did walking meditation through the dark to Omega's lake, several veterans carrying the paper altarcloth decorated with the names of the dead. Standing under the stars holding candles, we sang the Two Promises while we burned the altarcloth and scattered the ashes into the shimmering water: "I vow to develop understanding in order to live peaceably with people, animals, and plants. I vow to develop my compassion, in order to protect the lives of people, animals and plants." I left the retreat inspired by the power of mindfulness practice to heal even the deepest of wounds. Practicing with the veterans was a tremendous opportunity to support them in their healing process while going further into my own. As Thay said early in the retreat, "If the non-veterans practice in order to have insight, the veterans will be healed. And if the veterans practice in order to have insight, the nonveterans will be healed. Because we inter-are." Anne Cushman is Associate Editor of Yoga Journal. Newer PostNow, Do You Want to Meditate with Me?